As you can tell from the title my guys received some Harringtons cat food in chicken with rice flavour and there has been much munching going on with it for the last few weeks. Both our boys are a bit fussy when it comes to food… something’s they will eat with such enthusiasm and leave their bowls looking like they were just taken out of the dishwasher yet totally ignore another seemingly equally yummy food – like with wet cat food – give them pouch and it is gone in seconds but give them the same food but from a tin and it would stand there for weeks (or in reality just a few minutes until Lilly the Labrador comes along and hoovers everything up). Same with dry food… with some of them they just walk around making extremely unhappy sounds, bemoaning their imminent demise due to starvation. Therefore I always worry when I am getting a new brand for them as I am not sure if it will be to their liking. 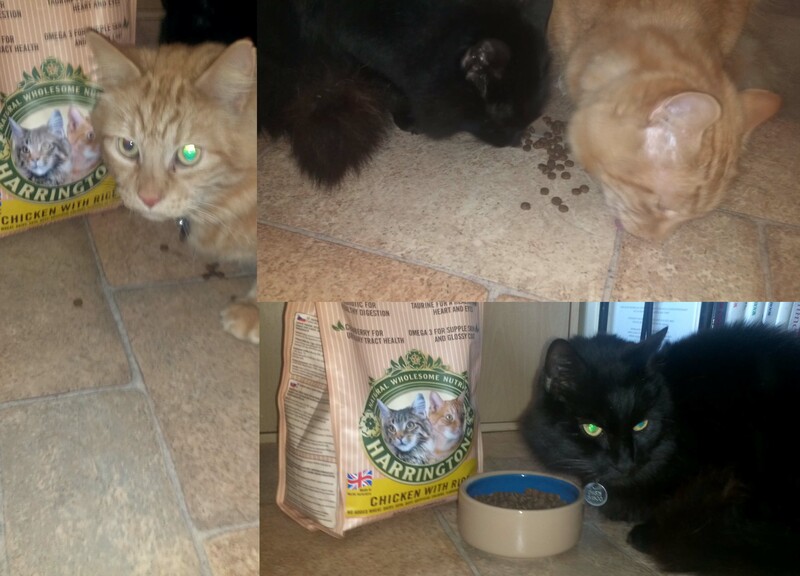 This time we got lucky and Harringtons cat food with chicken and rice was very much to their liking. Harringtons cat food – chicken with rice – is a complete food for adults cats. According to the information on their website it can be eaten by kittens from 8 weeks onwards. 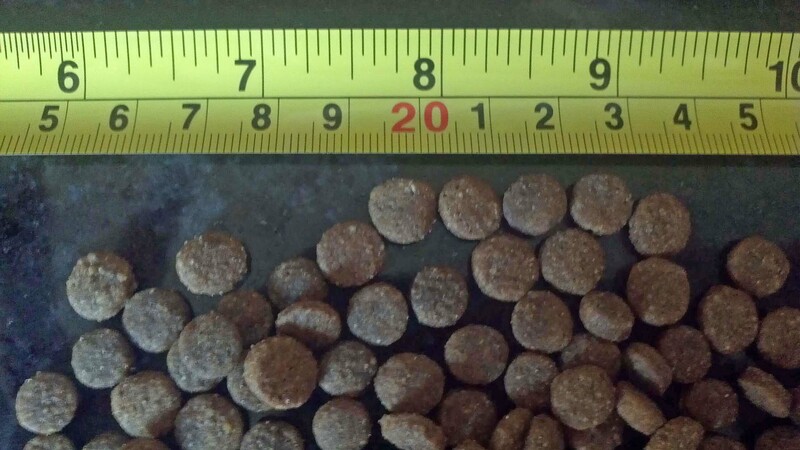 It is important to know and understand what is “inside” our pet’s food. Have a look below if you are interested to see how this is breaking down. Composition: Chicken Meat Meal (40%), Maize, Rice (10%), Poultry Fat, Digest, Fish Oil, Beet Pulp, Minerals, Yeast (0.1%), Cranberry Extract (0.05%), Yucca Extract (0.02%). Additives (Per Kg): Nutritional Additives: Vitamin A 21,000 iu, Vitamin D3 1995 iu, Vitamin E (alpha tocopherol acetate) 220 iu, Taurine 750 mg, Iron Sulphate 165 mg, Calcium Iodate 2.5 mg, Cupric Sulphate Pentahydrate 20 mg, Manganous Oxide 65 mg, Zinc Oxide 135 mg, Sodium Selenite 0.2 mg. Antioxidant – (contains tocopherol rich extracts – a natural antioxidant). Analytical Constituents: Protein 30%, Fat Content 12%, Crude Fibre 2.5%, Crude Ash 7.5%, Omega 6, 1.7%, Omega 3, 0.3%, Calcium 1.4%, Phosphorous 1%. To give you a comparison – Harringtons cat food with chicken and rice has 40% chicken meat meal and yet a household name and well know brand available in every superstore for your convenience and starting with “W” has only 4%! Shocking isn’t it? Many pet owners do not check what’s inside the box when it comes to pet food. It is sad but true. We all should be aware of what exactly we feed our pets. 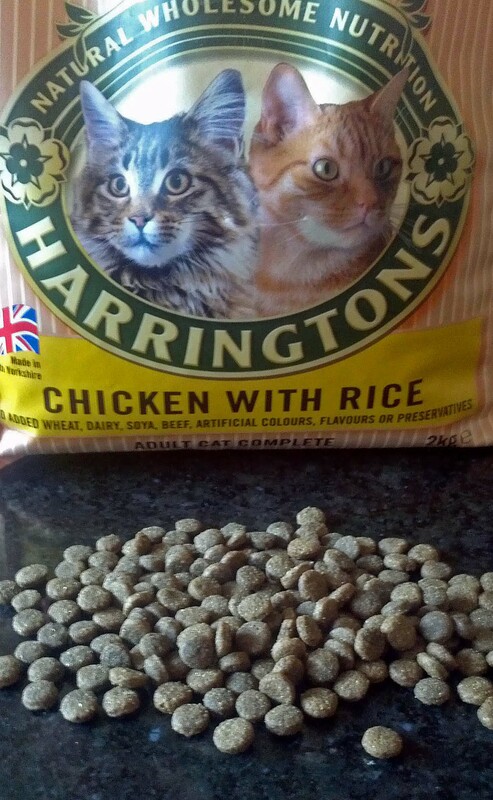 Harringtons cat food chicken with rice is available in 500g boxes or 2kg bags. Packaging comes with a printed panel that provides you with feeding instruction regarding the correct amounts according to the size of your cat (this is not very clear to be honest – I can see small, medium and large cat but no weight specifications). Food comes with no measuring cup and bag is not re-sealable. All other relevant information present on the packaging include: benefits, ingredients etc and best before date (yes, pet food can go off as well). The plus is that Harringtons cat food is also available in some supermarkets for your convenience (Asda and Tesco). Next time you are doing your groceries take a minute to check the pet aisle and read what exactly goes inside your pet food! And if you are not a cat person, Harringtons also makes dog food and dog treats as well as rabbit and guinea pig food. How do you choose your pet food? * I received one 2kg bag of Harringtons cat food for free for review purpose. All opinions about the products are honest and my own. I am glad your kitty loves the food. We recently tried Harrington’s and our pets loved it. There are telltale signs with ours whether it’s good for them- and this got this big paws up. Our only disappointment was that whilst the dog food seems well stocked at local supermarkets, the cat food seems rather harder to come by. I don’t have any pets so I can’t really tell you what my cat prefers but I guess like humans cats have their preferences too. I now buy new food in the smallest quantities available just incase!! She’s not so fussy when it comes to eating dead mice and rabbits though. We had a really picky cat that would not eat hard cat food at all! We tried everything to get him to eat it! 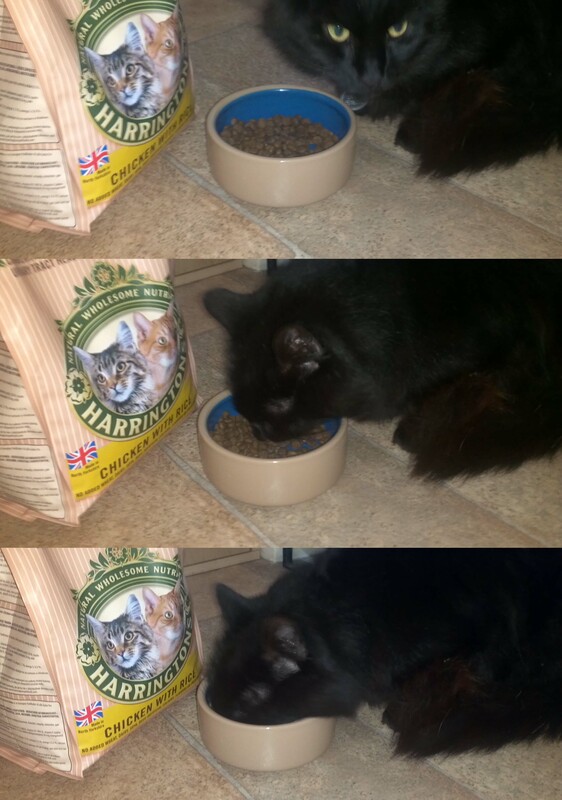 We feed our cats Harringtons too and they love it! I think it’s important to check what you feed your kitties too, after all you wouldn’t feed your baby something without checking exactly what it was before. Great review!